If your experience is anything like mine, most of the interesting projects around you are having a larger mobile component this year than last year. I think this trend will continue. It can be a mobile-first website or a custom internal app for a company that wants their workers to be more effective when they are in the field. It can be an app to engage your customers or an intelligent sensor or “thing”. We now have the technology to move lots of applications that used to be tied to a workstation over to a mobile device and in so doing unshackle people from their desks. But this leads to a new challenge for developers: If you were an “enterprise developer”, you’re used to large data volumes, complex domain models and integration with various systems in various degrees of disrepair. If you were an “apps developer”, you were used to multiple device configuration, designing for small surfaces, and APIs with various peculiarities. Now the need has come for people who combine those skills. When we compared notes, many of us had almost identical ideas about what we thought a Mobile conference could mean. In the front and center of the picture, you can see Maxim Salnikov who came up with the name that embodied everything we had in mind. Thus the Mobile Era conference was born. After a long and winding road, Mobile Era is only a month away. We have an amazing program with deeply technical subjects like the Realm Mobile database, Mobile DevOps, the new Awareness API in Android, performance tuning in Swift, ionic 2 features, React Native, Firebase, IoT. If you wanted to catch up on what’s happening all over the Mobile space, now is your chance! When I look at my own preferences, I see that I more and more often leave the computer behind and use my mobile instead. I do code review on my mobile, I watch tech talks on my mobile (as well as tv), I receive production logs on my mobile, I deploy the next version of my software on my mobile. In the Mobile Era, I expect my users to demand as much from the software I write. PS: The early bird closed last week, but if you write a comment on this blog post, I’ll email you a special discount code which is valid for another week or so. I die a little bit inside when people say “should we do Agile or not”. The assumptions behind this question are all wrong: That there is one way to “be Agile”, that learning from Agile methods like Scrum requires that you use everything in those methods, and that there are good reasons to be “not Agile”. All of this is wrong. To me, the most essential lesson that the Agile manifesto tries to communicate is that of Feedback. And frankly, if you’re ignoring feedback on your project, you’re stupid. There are different constraints around the feedback on different project, but essentially, delaying feedback is delaying critical learning. The most essential manifestation of feedback in Scrum is the Sprint review, or demo. No matter if you’re calling what you do “Scrum”, “Kanban”, “Cowboy coding”, “Waterfall” (which is more like Cowboy coding than a real process) or just “the way we do stuff here”, you will get benefit from showing what you’ve done to someone who cares frequently. For some projects, “someone who cares” may be an end user, while for other projects it’s not feasible to involve end-users frequently. On some projects, “frequently” may mean every day, other projects may not be able to do more than once every month. You may even find that nobody cares about what you do. If that’s the case, surely you can find more relaxing ways of doing it. When you are showing what you’ve done to someone who cares frequently, you can improve. You can think about how to show it better, how to have the show more accurately reflect what you’ve done, how to involve more people or people how care more and how you can do it even more frequently. Some of the techniques of Scrum may help you do that, but use whatever source of inspiration you like. No matter if you’re excited about the word “Agile” or not, if you’re not getting feedback, you’re not only non-Agile, you’re non-smart. I recently read The Git Book. As I went through the Git Internals parts, it struck me how simple and elegant the structure of Git really is. I decided that I just had to create my own little library to work with Git repositories (as you do). I call the result Silly Jgit. In this article, I will be walking through the code. This article is for you if you want to understand Git a bit deeper or perhaps even want to work directly with a Git repository in your favorite programming language. I will be walking through four topics: 1) Reading a raw commit from a repository, 2) Reading the tree hash of the root of a commit, 3) parsing the file list of a directory tree, and 4) Reading the file contents from a subdirectory of a commit root. When we have the commit information, we can parse it to find the tree hash. The tree hash references another file under .git/objects which contains the index of the root directory of the files in the commit. In the example above, the tree hash is “c03265971361724e18e31cc83e5c60cd0e0f5754”. But before we read the tree hash, we have to read the object type (in this case a “commit”) and size (in this case 237). tree 130 100644 FOO æ?â?²ÑÖCK?)®wZØÂä?S? The next part of this article will show how to deal with this. This prints the contents of our file. Obviously, if you want to find a file a subdirectory, you’ll have to do a bit more work: Parse another tree object and look and an entry in that object, etc. This blog post shows how in less than 50 lines of code, with no dependencies (but a small utility helper class), we can find the head commit of a git repository, parse the file listing of the root of the file tree for that commit and print out the contents of a file. The most difficult part was to discover that it was the InflaterInputStream and not Zip or Gzip that was needed to unpack a git object. My silly-jgit project supports reading and writing commits, trees and hashes from .git/objects. This is just the core subset of the Git plumbing commands. Furthermore, just as I wrote the article, I noticed that git often packs objects into .git/objects/pack. This adds a totally new dimension that I haven’t dealt with before. I hope that nobody is crazy enough to actually use my silly Git library for Java. But I do hope that this article gave you some feeling of Git mastery. For those of you who already use PuTTY: Here’s a little improvement that’s surprisingly little known. Probably because it is very hard to explain. But I’ll try. You will now log in automatically. In order to streamline things even more, notice how Saved sessions show up under the Pageant icon in your system tray. Is Steve Jobs really a benevolent dictator? It’s not secret that Apple likes to control their platform tightly. As long as their dictatorship is a benevolent one, whether you find this objectionable or not is a rather uninteresting question. But lately, the question seems to be less and less academic: Google’s Voice Application for the iPhone got rejected and two existing applications (GV Mobile and Voicecentral) were removed from the AppStore! This is an extremely nasty thing to do to the developers. To make matters worse, Apple is seeking to sue users who jailbreak their phones. Yes, you can actually sue for that! The latest WFT-Apple moment was the news of the Ninjawords dictionary application which was forced to censor naughty words out of wiktionary. So far, Apple’s actions have mostly hurt developers. But eventually, when developers on a platform suffer, users suffer as well. You may think Microsoft is a bloated company and that Steve Ballmer is a weirdo, but when he shouts “Developers, Developers, Developers, Developers” he understands something that Steve Jobs just doesn’t get. So the iPhone is seeming rather unattractive now. I’m looking forward to what seems to be an Android-filled fall! This Norwegian language post describes my response to the report from a task force exploring a common IT-architecture for the public sector in Norway. Den norske regjeringen har besluttet at en felles IKT-arkitektur for offentlig sektor ville være fint. Jeg fikk greie på arbeidet på tirsdag, og har lest rapport til den store gullmedalje. Jeg er fortsatt ikke helt sikker på hva som menes med “felles IKT-arkitekt”, men jeg kan se omrisset av mange store evighetsprosjekter i dokumentet. Jeg har forfattet et svar på rapporten. Spesielt er jeg bekymret for at dette skal bli en unnskyldning for store SOA-prosjekter uten veldefinerte formål. Rapporten beskriver en god del ønskede effektmål, men disse beskrives i såpass runde former at man aldri kommer til å etterprøve om prosjekter faktisk oppfyller dem. Formålene er ting som økt grad av interoperabilitet. Frykt nummer to ligger i hvordan SOA-krigen går om dagen. Rapporten nevner veldig lite konkret på teknologier, så jeg slapp unna å gå inn i dette minefeltet. I stedet må jeg ligge våken og frykte effekten av de usagte ordene i rapporten. Jeg har startet å høre om dogmatiske SOA-prosjekter som ikke lykkes, til tross for store investeringer. REST starter å bli mer akseptabelt å snakke om i høflig selskap. Men fremdeles virker det som om at “SOA prosjekt” er et kodeord for “vi skal kjøpe dyr WS-* programvare fra Oracle, IBM eller Microsoft”. Jeg skulle ønske jeg hadde mer erfaring innen offentlig sektor før jeg skulle uttale meg om dette, men dersom det er som noe annet jeg har sett, handler interoperabilitet grunnleggende sett om å sende eller motta informasjon på et standardisert format. Det betyr tre ting: En aksjon (les, oppdater, lever), noe som identifiserer et objekt (søknad, personopplysning) og et innhold (“Jeg ønsker med dette herved å søke om bla bla bla”). Og her har WS-* skadet oss mye. Når man bygde standarden SOAP (Simple Object Access Protocol, som verken er enkel eller handler om “object access”), skrellet man vekk to fine deler av HTTP standarden: Verb (GET, POST, PUT – det vil si “aksjoner”) og URL’er (det vil si den nøkkelen som representerer et objekt). Det betyr at vi ikke lenger kan si “legg til” (POST) en “søknad” (http://etat.no/tjeneste/soknad/) som inneholder noe data (ikke en del av standarden). I stedet må vi si “send en melding som inneholder informasjon om noe vi tenker å gjøre” (ikke en del av standarden). I en rimelig verden burde interoperabilitet betydd at å utveksle informasjon om objekter burde være en del av en universell standard som er akseptert rundt hele verden. En standard basert på å sende meldinger om å utføre én eller annen oppgave (som for eksempel å utveksle et objekt) virker sørgelig utilstrekkelig. Og offentlig sektor i lille Norge kan vel ikke være den som brøyter vei her. Så lenge SOA-krigen pågår er jeg ikke optimistisk for sjansene til at en rimelig standard dukker opp. Anders Nordås wrote a blog post where he talks a little about how he uses his beautiful moleskin notebook. I will pick up his challenge and write about my favorite tool, Post It notes. As many who know me are aware, I always have a pad of Post-It notes and a pen in my left pants pocket. I use the sticky notes for todo-lists, note taking in meetings, planning talks and doing brain dumps. After the jump, I post a few examples of Post-It notes from my pocket. If you though getting started with Rails seemed easy from my first post, you haven’t tried out Heroku yet. Heroku is a hosted solution for Rails that comes with a browser based IDE. There’s nothing to install. It is so easy that it’s almost ridiculous. To me, this is the future of application hosting. One of the remarkable things about Rails is that it lets you get up and running very quickly. Here is what you need to do to get your first application up and running on Heroku. The coolest Eclipse plugin ever! I have just one thing to say: w00t! 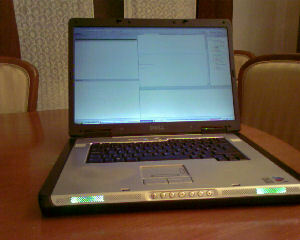 Litrik used my C code to control the lights of the Dell XPS computer and integrated them into an Eclipse plugin. Coolest plugin EWAR!!one!! See more about it on the project blog. 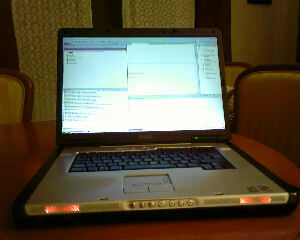 I have exported the XPS light control source code into my subversion repository. The software is currently set up to build with Cygwin. As an added bonus, I now have added a target that creates a dll so the code can be reused more easily.